Do you want to eat protein pancakes regularly but find them challenging to make? 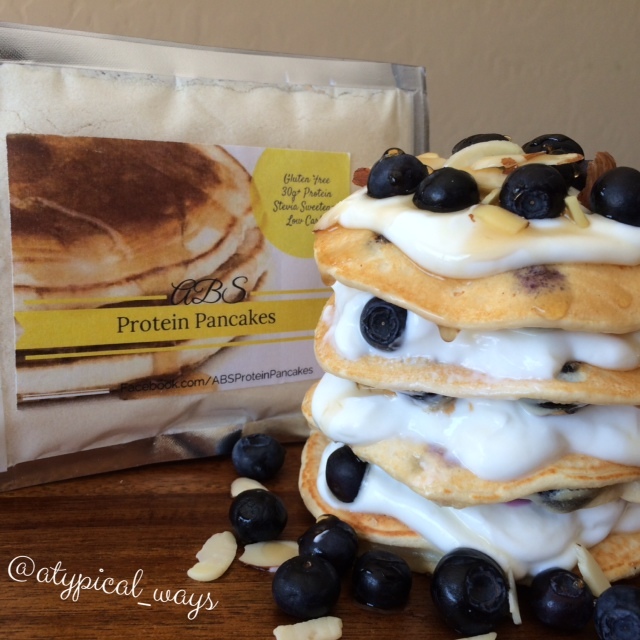 Well look no further, ABS Protein Pancakes (@abs_proteinpancakes) has the solution for you! I just got these in the mail after picking them up online. I had seen a few other woman in the fitness industry posting about them so I had to give them a try! They are all gluten-free, low sugar, low carb, low calorie (all under 250) & packed full of protein – 30+grams! They currently come in 3 different flavors: Vanilla Cake Batter(seen in picture), Cinnamon Swirl & Chocolate Chip! Now are you ready for the best part…all you need is 1/3 cup of egg whites & 1/3 cup of milk of choice to make them! They are SO SIMPLE! You just empty the pouch into a bowl, add the egg and the milk & stir – that’s it! Then onto the griddle they go! My 4 year old son could make these. « Strawberries & Cream Ice Cream Sandwich Sundae with only 150 calories! they look amazing I just wish they gave a nutrition label or a more specific calories count.. I will post full details a little later as it is on the packaging!! thanks id appreciate that before I order them ! !